The goal of this project is to develop reliable, light-weight and low-power thermal management systems for precision temperature control of critical NASA electronic systems. This project develops high-performance, two-phase mechanically-pumped fluid loop (2φMPFL) systems. The 2φMPFL can maintain the temperature of several components to within precise limits even if their heat generation varies by a wide amount. The porous metallic wick used in the heat-acquiring and isothermalizing evaporator is a key component of the 2φMPFL system. In this project, a quasi-two-dimensional experimental setup has been developed to study two-phase fluid flow in porous media to benchmark computational fluid dynamic (CFD) simulation tools. A scalable and performance-effective technique for enhancing steam condensation heat transfer rate and critical heat flux limit was also developed. A new technique to measure the size distribution of droplets on flat plates was developed by applying a droplet detection method to images of condensate-drops on the sample surface. Demonstration labs on the design and applications of heat pipes were created and demonstrated to approximately 145 community college students who are considering entering an engineering field. The students gained background information on thermal heat pump applications. This research effort was funded by a NASA EPSCoR Research Cooperative Agreement Notice (CAN) award, #NNX15AM77A and involves close collaboration with Eric Sunada (JPL), Ben Furst (JPL) and Jentung Ku (Goddard Space Flight Center). 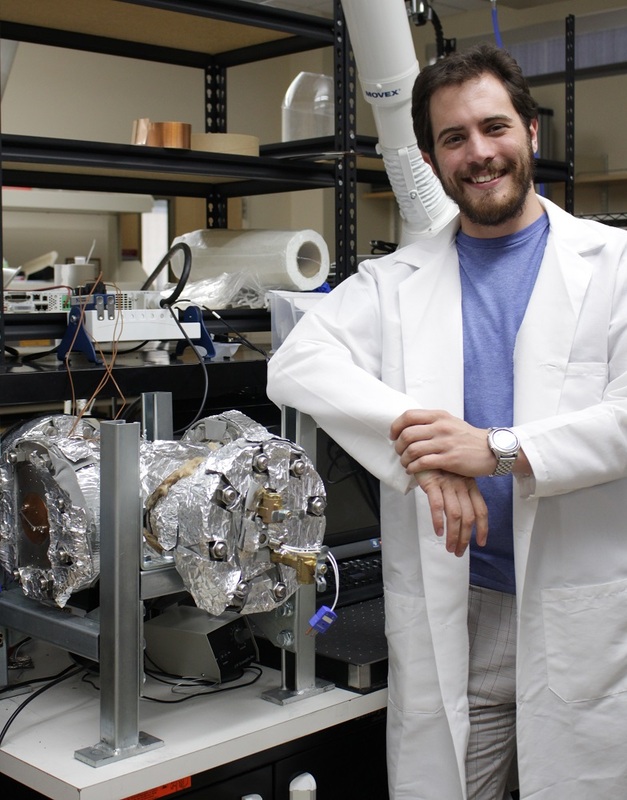 Mr. Blake Naccarato of UNLV with the PC-HEX apparatus he developed.